Are you seeking, praying and being obedient to God but you're still not sure about the next step or where your life is going? You are trying to put your trust in him and believe he has a plan and yet nothing is happening. What do you do? You ask for a sign! A sign that God still has a plan, a sign that he is listening, a sign that you are still on the right path, a sign just to reassure, for anything, you just want a sign. Are you behaving like the Pharisees in keep asking for a sign? Is Jesus saying "Why do you ask for a sign? No sign will be given" (7:12). If Jesus had given them a sign of complete confirmation that he was the Son of God they would have no choice but to believe, they would not need faith because they would have knowledge. If Jesus gives you the sign you want, the exact answer, a complete map you would follow it but there would be no leap of faith. Trust is a basic foundation of any relationship, and the deepest kind is a child-like trust. Ask a child to close their eyes and hold out their hand to receive a gift and in trust and anticipation the child will gladly close their eyes and hold our their hand to receive the gift without knowing what it might be. Try doing the same with an adult, they will be suspicious, want to know what it is first and want reassurance that it won't be anything horrid. Why can children do it? They trust you. They already know it will not be something bad, slimy or deadly. They don't know what it will be, but it will be good. Read how Jesus illustrates this in Matthew. God only gives good gifts and he wants the kind of trusting relationship with you where you will hold out your hands with your eyes closed knowing that whatever he gives you will be good. As we get older we lose that kind of trust, the evil of the world becomes more recognisable and we learn that not everyone can be trusted. The giver of the gift has not changed we have. A father comes before Jesus in chapter 9 in need of healing for his son, but he has no trust he says "but if you can do anything" (22). I wonder how Jesus feels when we approach him saying, "If you can"? Is there really anything you think he cannot do? Jesus' power is infinite he can do everything but you have to believe it. Jesus says to the you and to the boys father that everything is possible if you believe it. You know that, I know that, the boys father knew that but he needed Jesus' help to overcome his unbelief, because even thought he knew it, he still didn't fully believe it. There is an invisible line between knowing that God wants good for you, and actually believing and trusting in it fully when nothing seems to be happening in your life. It is that line that Jesus is reaching over to pull you across into a deeper relationship with him. So how do you cross the line? You strengthen your relationship with God, which strengthens your faith, trust and belief. How? Read the story again. It begins with the disciples being unable to drive out the Spirit, why couldn't they do it? They had the power and authority but they didn't have the belief of the boys father. When we petition God or the elders on behalf of someone we need to believe in the outcome. If you have lifted someone to God, you have entrusted them into God's hand but do you trust that he can answer your prayer for them? Are you praying or, have you just handed it to God to deal with? The disciples ask why they could not deal with the evil spirit and Jesus points to the need for prayer and fasting. When you tell someone you will pray for them or when you have a need yourself are you giving it over to God and just hoping he will deal with it or are you also involved in the process with him through prayer and fasting? God does not want you to throw your needs to him like a hot potato; he wants to sit with you a while, talk about it, he wants to spend time with you. How often have I requested prayer without praying for the situation myself, reassured that someone else is covering me and then surprised when I get no answers. Yes, Jesus can answer prayer, he can use others to do it, but he wants you to come to him in prayer and fasting to work on your unbelief. 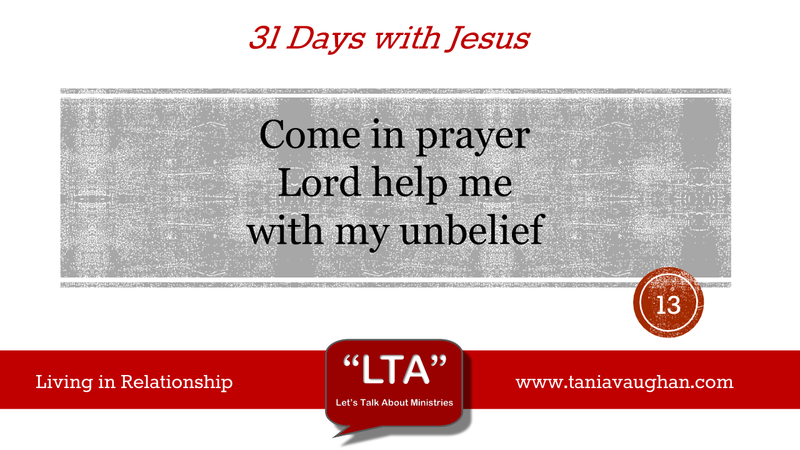 Is there unbelief that you need help with? Have you been asking for prayer, without praying yourself? Have you been asking for signs, rather than asking to know Jesus better? Lord, thank you that the plans you have for me and the blessings you pour out on me are always good. Help me to have that child-like trust, I want to stand before you with my eyes closed and hands open to receive whatever you have for me. Lord, I echo the father's plea, help me in my unbelief.